This site is intended as an travel guide for residents, tourists and surfers to the vacation beach resort area of Playa La Saladita - Zihuatanejo, Mexico and the nearby communities of Troncones and Ixtapa. The Directory sections feature information for Vacation Rental Houses as well as Guided Tours, Surfing, Restaurants, Diving, Surfing, Sport Fishing Charters. 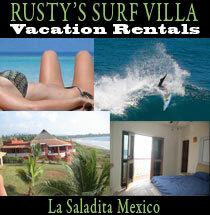 If your looking for a great time surfing in mexico be sure to check out Rusty's Surf Villa located around a half hour from the international airport in zihuatenejo mexico after a short trip from the air port you will land in surfers paradise ( Punta La Saladita ) a super clean left hand point break that seems to break forever. Hey people we are adding some new categories and travel sections soon so keep posted. One reason to want to travel to the La Saladita is the awesome surfing. The beach there is clean friendly in a tropical setting with a super long left point break perfect for longboarding and shortboarders wont feel left out either because a mere fifeteen minutes drive away is "The Ranch" a heavy wave for shortboarders only. The point is world renowned for its consistent surf perfect for longboarding with super long rides. Definitely one of the best waves in mexico. Dude! it was triple overhead you should have seen it!